Grandson of former Saskatchewan premier Tommy Douglas, leader of the first elected socialist government in North America. Douglas was premier from 1944-1961, and was known as the father of Canada’s government-funded medical system. Owns Ironworks Studio together with his musical partner singer/songwriter/composer Jude Cole. Kiefer also owns a valuable collection of about 50 vintage guitars which he and his partners has been playing in studio sessions and live performances. Among the many reasons cited for the break-up of his first marriage, one was his friendship with The Lost Boys (1987) castmate Jason Patric and other members of the “brat pack” — ironically enough, his friendship with Jason Patric dissolved after his fiancé Julia Roberts left with Patric for Europe three days before her scheduled 1991 marriage to Sutherland was to take place. In 2011, Sutherland and Patric costarred in the Broadway revival of Patric’s father’s play “That Championship Season”. Plays ice hockey on a celebrity team. Earned first place in the US Team Roping Championships. Twin sister Rachel Sutherland is a television post-production supervisor in Toronto. Named after Warren Kiefer. Sabatini directed Castle of the Living Dead (1964), in which Donald Sutherland made his theatrical film debut. Daughter, Sarah Sutherland, with Camelia Kath, was born on February 18, 1988. Was Gary Oldman’s passenger when Oldman was arrested for drunk driving in 1991. Daughter, Sarah Sutherland, likes to make fun of the fact that he’s computer illiterate. During filming of Stand by Me (1986), stayed in character off-camera by often picking on Wil Wheaton, River Phoenix, Corey Feldman and Jerry O’Connell. In an episode of 24 (2001), his character mentions that he and his wife and daughter should take a trip up into Canada. His father, Donald Sutherland, was born in Saint John, New Brunswick. Is on screen for less than three minutes in Taking Lives (2004), even though he shares top billing with Ethan Hawke and Angelina Jolie. Appears in one scene of Article 99 (1992) wearing glasses and a fishing bucket hat, a tip to father Donald Sutherland, who sported the same look in MASH (1970). For his role in The Wild (2006), he had to practice roaring like a lion. Rather than doing it at his home with his daughter and stepdaughter around, he practiced in his car while driving on the freeway, completely unaware of a woman in the next lane watching him. When starting up on the rodeo circuit he decided to buy all the things needed. The horses, the bulls/cows, the tractors, the 900 acre ranch in Montana, then sold it once he was finished. His role as Jack Bauer in 24 (2001) is his first regular role on a television series. Had L.A. Confidential (1997) been made into a television series, he would have played the Kevin Spacey character, Jack Vincennes. In an episode of 24 (2001), he is told a character is being transferred from Los Angeles to Guantanamo Bay in Cuba for questioning. In A Few Good Men (1992), he played a Marine stationed at Guantanamo Bay. Within the same year, had played the character of The Caller in the movie Phone Booth (2002) and of Jack Bauer in the television series 24 (2001). Both projects were created by Fox. The events of both projects take place in “real time”. And both projects were delayed by Fox due to real-life events: 24 (2001) due to the 9/11 al-Qa’ida terrorist attacks, and Phone Booth (2002) due to the D.C. sniper shootings by John Allen Muhammad and Lee Boyd Malvo. “24”‘s 1st season began airing in October 2001, while Phone Booth had its release date moved from November 15, 2002 to April 4, 2003. Even though he physically appears onscreen for less than three minutes in Phone Booth (2002), he received second billing behind Colin Farrell. Wasn’t aware of father Donald Sutherland as an actor until he was 18. His stepdaughter Michelle Kath was expecting her first child in February 2005. On January 23, 2005, became the first Inside the Actors Studio (1994) guest to be the offspring of a former guest. His father, Donald Sutherland appeared on the show in 1998. Was originally slated to play grandfather Tommy Douglas in Prairie Giant: The Tommy Douglas Story (2006), but had to relinquish the role in late 2004 due to scheduling conflicts with the fourth season of 24 (2001). Is seven minutes older than sister Rachel Sutherland. When he was eight, he moved to Canada where he spent the next eight years of his life. He left Canada to do commercials in New York. In 1983, he landed a jeans advertisement and got enough money to buy a car and go to California. His daughter, Sarah Sutherland, was part of the graduating class of 2006 from Crossroads School for Arts & Sciences in Santa Monica, California (Vanity Fair Magazine, February 2005). In an episode of 24 (2001), his character Jack Bauer is brought back after a heart failure. The same thing happened in Flatliners (1990), where he played Nelson. Is close friends with hockey legend Wayne Gretzky. On the Freeway (1996) DVD cover, he has a five o’clock shadow, but in the film itself, he is clean shaven. During the fourth season of 24 (2001), he filmed a Public Service Announcement to tell viewers that the show’s creators were not trying to exploit 9/11 in their storylines, and that the whole terrorist storyline was fictional. Attended the funeral of actor Brandon Lee (who was accidentally shot by Michael Massee while filming The Crow (1994)). Coincidentally, Massee later played villain Ira Gaines in the first season of 24 (2001). Is the spokesperson for Calorie Mate Japan in character from 24 (2001). Attended St. Andrew’s College in Aurora, Ontario. Owns a recording studio/music label in Los Angeles, called Ironworks, with best friend, musician/producer Jude Cole. Has three half-brothers: Roeg Sutherland (b. 1974), Rossif Sutherland (b. 1978) and Angus Sutherland (b. 1982). At about 5′ 9″, Kiefer is extremely short by the standards of his father’s side of the family. For example, his father stands 6′ 4″ and his half-brothers are all well over 6 feet. Starred alongside Dennis Hopper in Flashback (1990). Hopper later played Victor Drazen in the final four episodes of Season One of 24 (2001). He appears with Kim Basinger in The Sentinel (2006). Basinger appeared in L.A. Confidential (1997), and Sutherland was going to play Jack Vincennes in the failed television pilot version, L.A. Confidential (2003). Has signed a contract to be in 3 more seasons of 24 (2001) after Season 5. The contract says he will be paid $40 million, which makes him the highest paid actor on a television drama. Is a huge fan of the rock band Queen. Broke three fingers in his first rodeo. Has spent 15 hours a day, six days a week, for the last five years on the set of 24 (2001). His grandfather (former Saskatchewan premier Tommy Douglas) was voted “The Greatest Canadian”. Upon the conclusion of season 5 of 24 (2001), Kiefer has spent more on-screen time as the character “Jack Bauer” than as all of his previous roles combined. He has also received more nominations for the show than his entire film career. His ex-wife, Camelia Kath, is the widow of Chicago guitarist Terry Kath. Ranked #68 on the 2006 Forbes Celebrity 100 list of the world’s most powerful celebrities. His earnings were a reported $23 million. His great-great-grandmother through male line was a third cousin of President Rutherford Birchard Hayes. 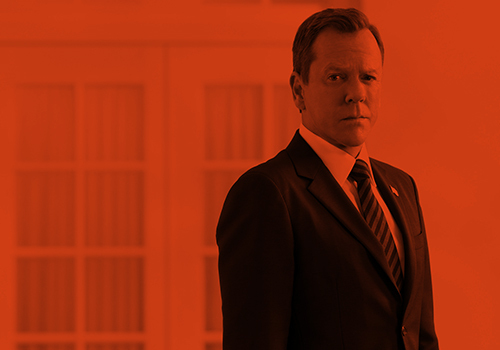 Ironically, on “24”‘s 5th season, his character Jack Bauer had to work with a Homeland Security agent named Karen Hayes. Is distantly related to former Governor of Vermont Howard Dean. Has a very large collection of vintage guitars (a 1959 Les Paul, a 1967 Telecaster, a 1968 ES335 and about fifty-five more). He has a border collie named Molly. Lived in the Silver Lake area of Los Angeles from 2002-2009. His 24 (2001) character Jack Bauer was spoofed by John Culshaw on Dead Ringers (2002). When his character, Jack Bauer, got a new tattoo (part of the plot line) for Season 3 of 24 (2001) instead of having to go though tedious make up for each scene which the tattoo would show, Kiefer had a real tattoo inked onto his arm. In 2005, he was inducted into Canada’s Walk of Fame in Toronto. Arrested on suspicion of DUI in Los Angeles on September 25, 2007. Sentenced to 48 days in jail for DUI. Started serving his sentence immediately [December 5, 2007]. He was awarded a Star on the Hollywood Walk of Fame for Television at 7024 Hollywood Boulevard in Hollywood, California. Considers his father, Donald Sutherland, to be one of the greatest actors of all-time. Has a pet hamster named Carlos. While visiting Rio de Janeiro, Brazil in 2007, he stayed at the world-famous Copacabana Palace Hotel. Was roommates with Robert Downey Jr. for three years during their early days in Hollywood in the 1980s. Sold his 14,400-square-foot loft/recording studio in Los Angeles’ Silver Lake area for $3,000,000. Paid $8.25 million to purchase a five-story town house in Manhattan’s West Village. His first name is the German word for pine and/or jaw. Sold his 5-story town house at 763 Greenwich St. in NYC’s West Village for $17.5 million in Sept. 2012. He and his father Donald have both played artist Paul Gauguin. Is related on both sides of his family to health care activists in two different countries. He is a cousin on his father’s side of Howard Dean, who vocally advocated the Affordable Health Care Act in the U.S. His maternal grandfather was Canadian Prime Minister Tommy Douglas, who pushed through Parliament a universal health care bill. He has Scottish, English, German, and Irish ancestry.